Snowbird is on every core skier’s top 10. The snow is so good here that Utah deems it “The Greatest Snow on Earth.” The proximity to Salt Lake City is a half hour – so flying in and skiing in the same day is totally achievable. Every skier deserves a week in the western sun, skiing deep powder, and delighting in the joy of après ski and spa treatments. Once you have kids in tow, a Utah ski trip may seem like a fluffy fantasy. Seriously, how can you fly the family to a remote Rocky Mountain resort, never mind get them all on skis, and stay within a budget? With direct flights to Salt Lake City, and lodging at Snowbird’s self-contained ski resort just 29 miles on a ski area shuttle, you can have your gang on mountain by noon. To sweeten the Snowbird deal, up to two children (12 and under) per adult ski free on lift and lodging packages. The cost of “Camp Snowbird” all-day kids ski instruction, is an additional expense – but it is worth the smiles on little skiers’ faces and the freedom for parents to make their own turns at this gorgeous Rocky resort. 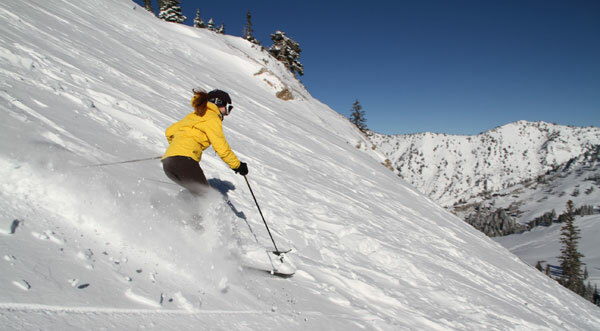 Snowbird, Utah is soup to nuts for skiing families: convenience, no rental car, all-inclusive packages, skiing for everyone in the clan, sunshine, and 40 feet of snow annually with one of the longest seasons in North America. To double your downhill fun, Snowbird has a reciprocal lift ticket with neighboring ski area Alta, accessing 4,700 combined acres. Staying slopeside at The Cliff Lodge, you can store everyone’s skis in the mezzanine level ski lockers, complete with glove and boot dryers, or rent gear from the in-hotel outlet. This reduces lugging copious amounts of equipment on ski mornings – and reduces clutter in your hotel suite. 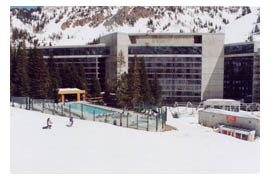 Camp Snowbird is conveniently located in the hotel – so you can stop, drop and go if you are eager to ski without encumbrance. If you prefer to make tracks with your tike, the beginner Chickadee lift is located adjacent to the Hotel – ironically right next to the outdoor heated pool and hot tub – so you have a visual relaxant during those first anxious turns. In a few simple ski turns, or a short walk, you are at the Plaza, a fancy name for Snowbird’s outdoor concrete courtyard, which encompasses three stories of skier services, shops and restaurants. This is also where you catch the Tram, the legendary base to summit lift. The tram ride rivals any amusement park ride your kids have encountered. The 125-passenger air-bus whisks you up 2,900’ vertical feet in six minutes. Even if the upper mountain is too much for your young skiers, you must bring them along for an exciting “tram ride” (up and down) one day. At the summit, you step out onto 11,000-foot Hidden Peak where the air is thin, the view is fantastic from the new Summit Lodge with 360 dining and seating, and the downhill options are bounteous. 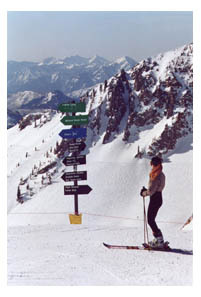 Snowbird’s summit offers skiing in all directions. Chip’s Run is a pleasant 2.5-mile intermediate family cruiser. Of course, The “Bird,” as its known to the vertically obsessed, also has several extreme bowls and numerous steep chutes, including the captivating Cirque. If tackling this vast vertical sounds o verwhelming, daily intermediate-level guided Mountain Tours are available. Mineral Basin offers 500-acre of backside bowls, a wide-open paradise in the sun most mornings, and serves as your connection to your next ski area – Alta. Crossing over this ski area border is reminiscent of skiing from Zermatt, Switzerland (Snowbird’s sister resort) to Cervinia, Italy. You are surrounded by glorious mountain peaks, and greeted by a high-elevation ticket checker. 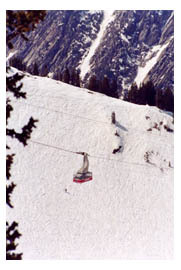 Sorry, snowboarders are turned away at this border; Alta remains one of four North American ski areas that prohibits riders. Moms may want to splurge on the Cliff Spa, Dad too. A refreshing splash in the rooftop pool is the perfect prelude to your therapy of hot stones, salt scrub or traditional Swedish massage. All of the Spa’s treatment rooms have superb views of the slopes, a rewarding reminder of your big Bird day. Snowbird is a ski area first and foremost –so don’t expect a Disney-atmosphere, however the resort continues to add after ski activities for kids including tubing and games, which coincide nicely with libation specials and lively entertainment for adults. For evening amusement, there is usually live music and sports on the big screen at the Tram Bar, plus movies, and a lecture series on topics like wolves or avalanche rescue that kids might enjoy.